What is Inside Glass Printing? How Does it Differ From a Standard Print Surface? You’re probably wondering what the difference is between inside glass decals and your typical decal (we’ll refer to these as standard decals as this is the default on our website and is called a “Standard Print Surface”); we’re sure you’re familiar with both but a little refresher course never hurt anyone. We’ve included some pictures below to help you distinguish between the two. Standard surface printing allows decals to be visible, even on highly reflective windows. 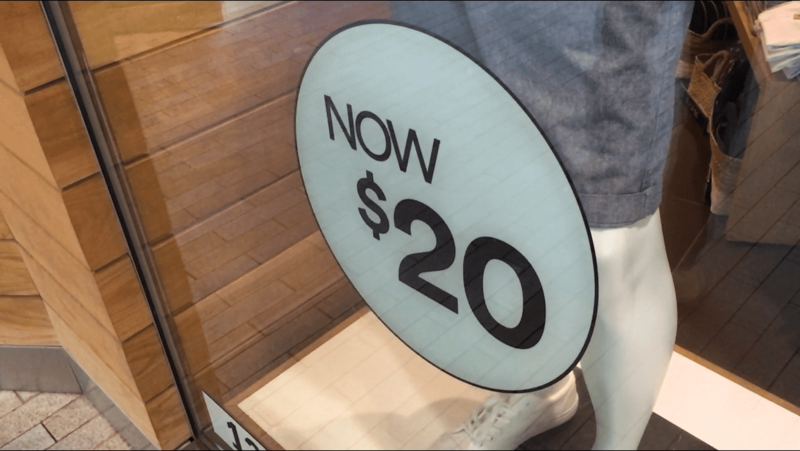 Inside glass window decals are often placed inside store windows to promote sales and promotions. Note the reflection of the window continues onto the surface of the decal because of the decals placement using inside glass. As you can see, inside glass decals are visible from the outside, but are placed on the inside face of the glass (hence the name inside glass). The adhesive will be on the front of the decal while the design will be printed on the back of the clear vinyl material, allowing it to show through to the front of the decal. Because the front side of the decal will not have any printed ink, it will stick to the surface of the glass on the inside. The same effect can be accomplished with opaque materials despite the idea seeming impossible given the solid material of our opaque window decals and opaque clings. 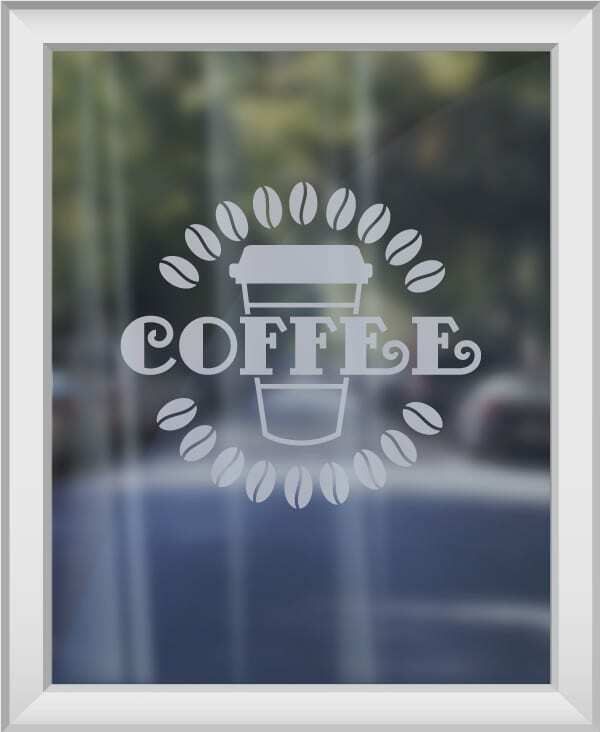 To get the Inside Glass functionality but with an opaque appearance your design will be printed on the back of the equivalent clear materials. The difference is that there will be a layer of white ink that is printed behind your design to give it an opaque appearance. Because it is a white ink background, rather than a solid opaque material, it won’t have the exact same appearance as an opaque decal but will be close. In both cases the adhesive will be on the front for an interior window placement. Using this workaround your decals or clings can be opaque in nature yet be placed inside and visible from outside. Opaque window decals that use inside glass have the color background printed on the rear side of the decal after your design is printed. 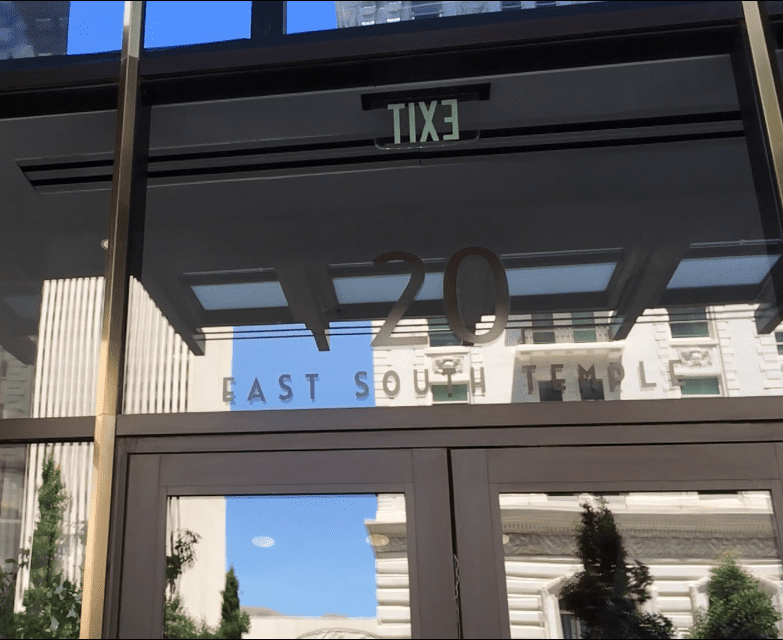 There are a number of different terms used within the signage industry for these two very different functionalities of your custom window decals. 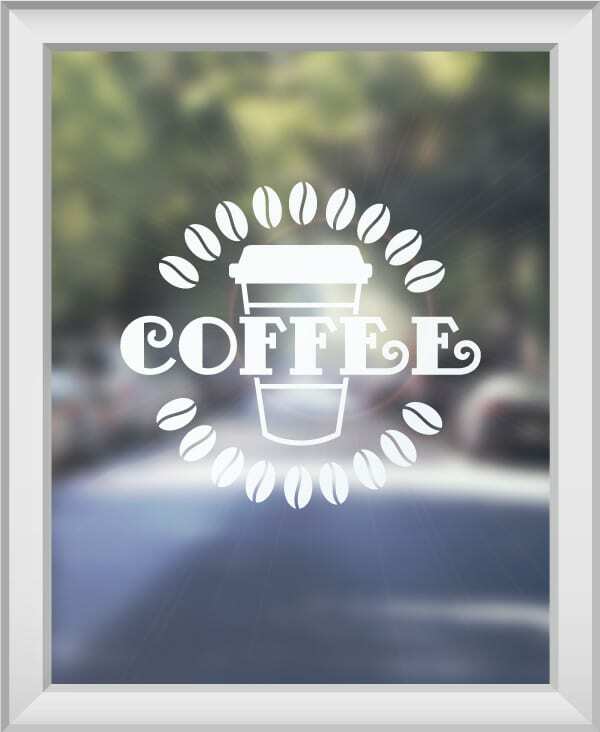 For decals that adhere to the inside and are visible from the outside there are: Inside Glass, Reverse Stickers, Adhesive On Front and Second Surface. For those that adhere to the exterior of your window and are still visible to those that approach your store, there are: Standard Surface, Adhesive on the Back, First Surface. Choosing to print your decals with an Inside Glass option has two primary advantages against traditional or Standard Surface printing. The first is that your decal may last longer because it is placed inside and will be protected from constant exposure to the elements. This is obviously more impactful for those that live where climates can be harsh. The second advantage of choosing an Inside Glass option is that it can prevent any unwanted removal from pesky hooligans (it’s always a possibility). While that may seem like an unimportant consideration, for large custom decals that represent your brand and are vital to your bottom line, every precaution helps if you think having them on the outside will invite the temptation for vandalism. If you live in a location that is free from harsh weather and the risk of vandalism is low then your decision between Inside Glass and Standard decals is largely one of preference. Though as described below there are some display considerations that are important to know about before making your final purchase decision. When planning to use inside glass decals, please consider the following conditions and design tips for the best practices. Colors and Contrast – Choosing the right colors for your windows will determine how visible the design is through the window itself. The contrast between the decal and its surroundings is one factor that determines the quality of visibility. For clear decals, take into consideration how the design contrasts with the inside space of the building. Check out our blog on letter visibility that explains contrasting colors in further detail. Even in the ideal environment, decals with low contrasting colors will be difficult to view through glass at a distance. If the interior of the building has poor contrast with the decal design, it’s going to be incredibly difficult to read. 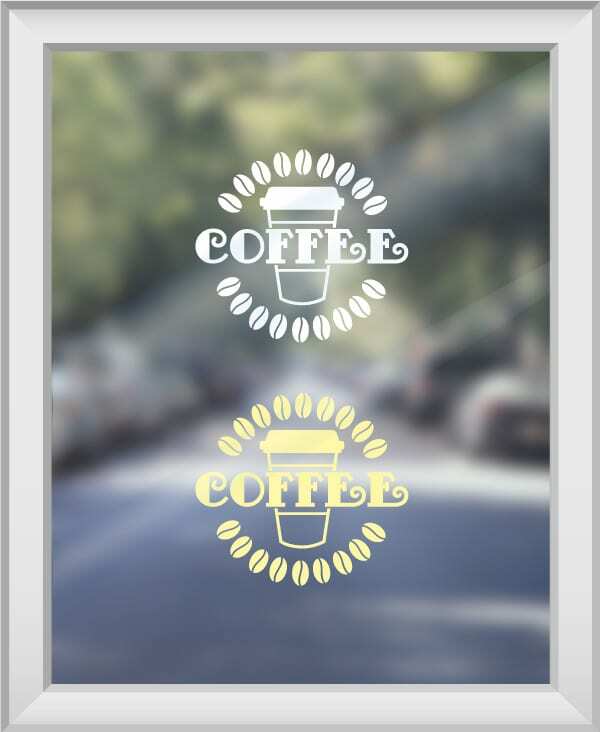 Window decals with an opaque background (as described above) will be easier to view than decals that have a clear background due to the inherent contrast that a background can provide the decal. All of this is even more true for windows that have glass that is thicker than standard. Glare – Inside glass decals can be affected by the glare on the window even more so than decals placed on the front surface of the glass. Make sure to keep this in mind and/or check on the intended location of your decal at different times of the day to gauge how much direct sunlight it gets before choosing your decal type. Standard decals may also be susceptible to some minor glare if light shines directly on the surface of the decal. Tinted Windows – Placing inside glass decals on tinted or frosted windows can limit (tinted) and even completely obstruct (frosted) the visibility of your design, making it especially difficult to view from a distance. For tinted windows we recommend using the color white to ensure there is enough contrast between the decal and the tinted window, even if placed on the inside of the glass. 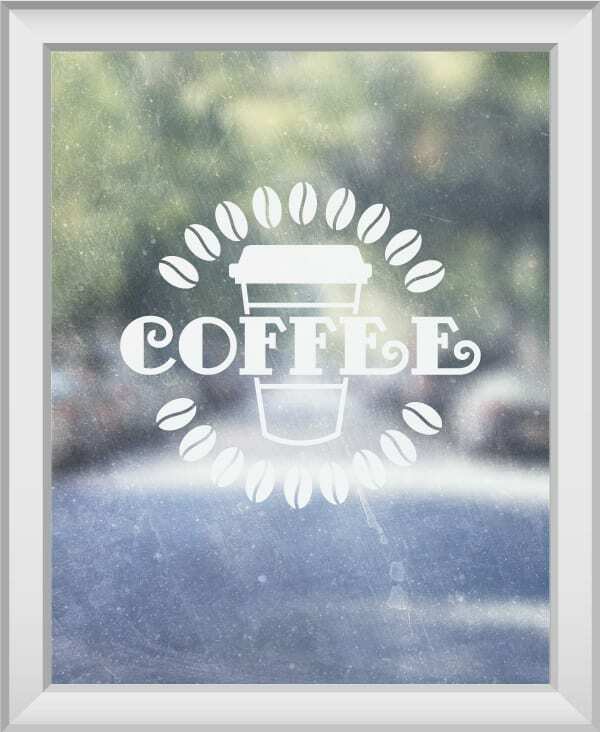 If you are looking to display a decal on frosted windows, do so using a standard decal. Window Cleanliness – Dirty windows lead to a harder-to-see decal. Make sure windows are spot and dirt free to ensure that the visibility of your decal isn’t obstructed. Dirty windows affect adhesion as well, so make sure to wipe the window down before applying the decal (for both inside glass and standard decals). Window Decals and Static Cling Decals – Both window decals and static cling decals can utilize the inside glass option (this includes both opaque and clear variations of the two). Perforated Decals and Frosted Decals – Both perforated window decals and frosted window decals cannot utilize the inside glass option. These decals can only be displayed on the outside of the glass. Nonetheless, they are both intended for outdoor use and have no problem withstanding the elements. The major difference between these two is the visibility offered. Perforated decals are intended to offer one way visibility (those within can see out but not vice versa) while custom frosted decals are typically used with the intent of obscuring visibility such as in internal offices. Vinyl Lettering – Vinyl lettering can be produced using the inside glass option. There are a number of factors to consider when deciding between an inside glass decal or one that is printed in a standard fashion. If you’re still unclear on which option will work best for you, our award-winning customer experience team is happy to help. We’d then be happy to help you design your decals for free! 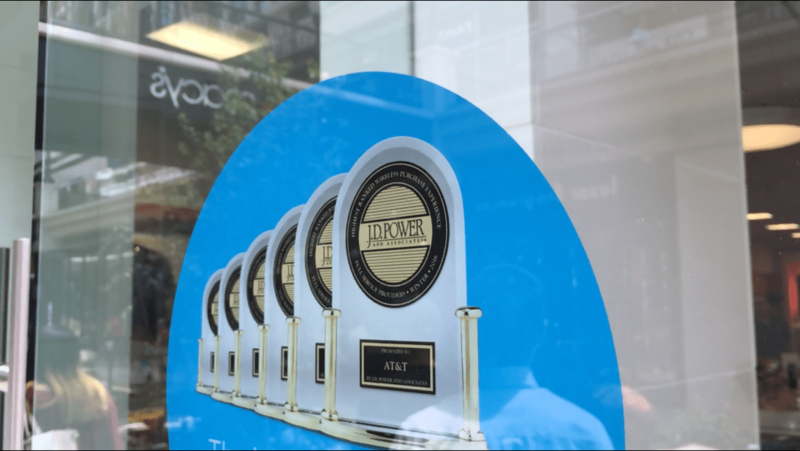 No matter what you choose, both inside glass and standard window decals are excellent options with which to brand your business and attract customers. For more information on window decals, visit our previous posts on window decal design, window decal installation, and the difference between vinyl lettering and decals. If you need free design help, or if you have any questions, give us a call at 888-222-4929.